Teeth whitening is a major part of Cosmetic Dentistry due the increase in consciousness of physical appearance and smile being the most important aspect of beauty and the first thing any person notices about you. Treatment plan for whitening one’s teeth varies widely based on the various causes of Tooth discoloration or staining seen which are of two major types – Intrinsic and Extrinsic. With Intrinsic stains requiring aggressive treatment with removal of some amount of tooth structure being required where as the extrinsic stains do not require any removal of tooth structure. So first knowing the cause of the Discoloration and seeing whether the stains are intrinsic or extrinsic plays a major role in planning the Treatment and the cost of Teeth Whitening procedure as well. Developmental Disorders: Amelogenesis imperfecta, Dentinogenesis imperfecta, Pink tooth or internal resorption. Foods and Drinks: Most common tooth discoloration food items are High amounts of Coffee, Tea, Red wine, Afrtifical colored Gum and Candy, Colored Soda, Artificial Fruit juices. 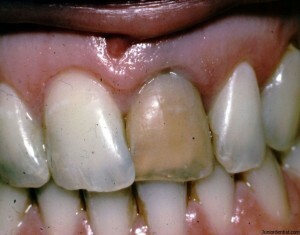 Tobacco: Smoking and Chewing of tobacco causes black stains. Poor Oral Hygiene: Lack of Tooth Brushing leads to discoloration of teeth due to retained colors from food products and also due to accumulation of Calculus. Fluorides: Fluoride stains are yellowish colored discoloration on enamel which is caused due to increase in fluoride in Water, Tooth paste and mouth washes. Trauma: Blackish discoloration of teeth is caused due to trauma when the nerve supply to the teeth is cut off due to external trauma. Over a period of time due to lack of blood and nerve supply the teeth turn into black color which is intrinsic. Medicines: Antibiotics given to children when the teeth are developing will lead to intrinsic stains due to accumilation of the antibiotic in the developing tooth germ. Doxycycline, Chlorhexidine, Cetylpyridine, Antihistamines(Benadryl) also Stain teeth. Old Age: Due to loss of the Enamel covering which exposes dentin which is the normal Yellow color which is exposed. 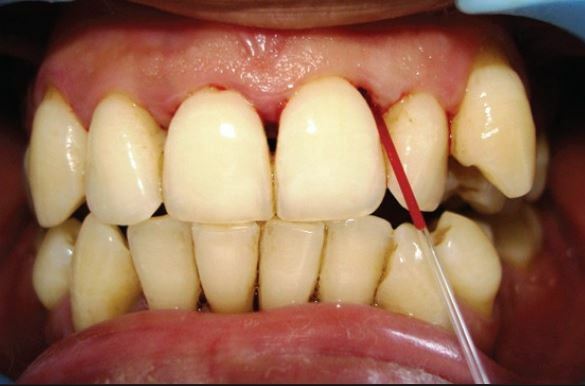 Oral Prophylaxis: General Oral prophylaxis technique includes Scaling + Polishing which is the most basic treatment procedure for cleaning extrinsic stains and Calculus. Bleaching: Bleaching is a tooth whitening technique which is of 3 types based on the necessity Walking Bleaching technique, At home Bleaching technique, In Clinic Bleaching technique. The materials used in Dental Bleaching technique are Hydrogen Peroxide and Carbamide Peroxide which play the most important role in teeth whitening technique. Bleaching works on the main principle of Peroxides effect on coloring agents. How do peroxides work: Peroxides break down (oxidizing) the pigmented compounds which get entrapped in the surface layer of enamel which gives out a colorless by product replacing the colored pigments. 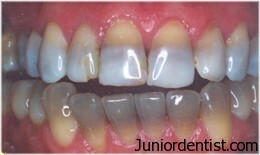 Laser Teeth whitening: Hydrogen Peroxide is applied in lower concentrations on the tooth surface and a Penetrating Laser light is used to activate the layer of Hydrogen Peroxide on the tooth surface which leads to whitening the surface of the stained tooth by removing the pigments leading to discoloration of teeth. Veneers:Veneering is the procedure which is used to paste a layer of material over the surface of the tooth covering or masking the surface defects on the tooth which can be due to physiological, pathological (fluorosis, stains) or hereditary conditions (amelogenesis, dentinogenesis imperfecta). Materials used commonly are Porcelains, Composites.